More than two dozen stars, appearing yellow near the center of this Spitzer Space Telescope image of the cluster RSGC2 are red supergiants. Warm dust in the region glows red. 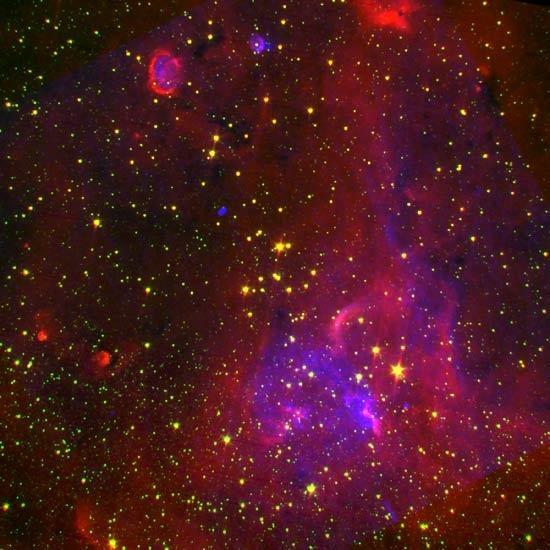 The blue oval with a pink outline at top left may be the result of an ancient supernova and the larger blue patch below center is a region of current star formation. Image credit: B. Davies/RIT/NASA. Red supergiant by Chesley Bonestell. A red supergiant is a star that is similar in nature but bigger and more massive than a red giant. Red supergiants typically span several hundred times the diameter of the Sun and have masses of more than 10 times that of the Sun. They belong to luminosity class I and are of spectral type M or K.
The red supergiant phase is extremely short-lived, lasting only a few hundred thousand to a million years. at most before ending in a supernova (see stars, evolution). It is believed that high-mass red supergiants evolve to become Wolf-Rayet stars before exploding as type Ib or Ic supernovae, while those of lower mass eventually explode as type II supernovae. Due to the scarcity of very massive stars and the briefness of the red supergiant stage, this type of star is extremely rare. Only about 200 are known in the entire Galaxy. Well-known examples include Betelgeuse and Antares. Among the largest known supergiants is Mu Cephei, also known as the Garnet Star. Although red supergiants are rare, clusters of them do exist. In 2006, a team led by Don Figer of the Rochester Institute of Technology (RIT) in New York announced it had found a massive cluster of about 20,000 stars, called RSGC1, which included 14 red supergiants. Lying near the center of the Galaxy, it was the largest grouping of these stars then known. In 2007, Ben Davies, also of RIT, and a team that includes Figer reported the discovery of an even bigger collection of 26 red supergiants in another cluster of young stars called RSGC2, which lies just a few hundred light-years from RSGC1. The two clusters are similar in age – both less than 20 million years old – although RSG2 contains more than twice as many stars, making it one of the most massive clusters of young stars in the Galaxy. The nearness of RSG1 and RSG2 is almost certainly not coincidental. There is other evidence of star formation in this region, which is where the Scutum-Crux spiral arm of the Galaxy meets the central bulge.